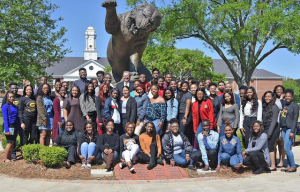 The tagline for KGRM, Grambling State University’s 50,000-watt radio station, is “Giving You Music and More…” and this spring for fifty-three fortunate students, the “more” was a $1,000 scholarship. The money was raised through a radiothon hosted by the station in partnership with the Grambling State’s Office of Institutional Advancement. Funds raised are used for scholarships and recruiting. Now in its sixth year, the 12-hour radiothon is held annually on the Friday before each homecoming game. Alumni, churches, local businesses, university administrators and employees, and station listeners are among the growing list of persons who participate in the on-air giving activity by taking their donations to the radio station, which is located in the Allen Williams Annex in the Washington-Johnson Complex on the campus. The scholarships are awarded each spring semester. This year’s radiothon, chaired by Dr. Edrene Frazier, associate professor of mass communication, is scheduled for Friday, November 2. The scholarships are available to full-time undergraduate and graduate students (who are not pursuing a doctorate) who are in good standing with the university and have an overall grade point average of 2.5. Each potential recipient must also submit a 500-word essay expressing a need for the scholarship. For more information on KGRM, the radiothon, or the scholarships, contact Joyce Evans at 318.274-6343 or evansjb@gram.edu. KGRM-FM is a 50,000-watt non-commercial educational radio station licensed to Grambling State University with a dual purpose of a laboratory function for students in the Department of Mass Communication and service to the community. KGRM is on the air for 24 hours a day, through the automation system operating on the 91.5 frequency. It offers a variety of music, news, sports and public affairs programming. The station is run by students and supervised by an Operations Manager. The students always exhibit an incredible work ethic, a strong belief in the power of education and an unwavering devotion to Grambling State University and Community. This entry was posted in Uncategorized on June 26, 2018 by Jovan Hackley.